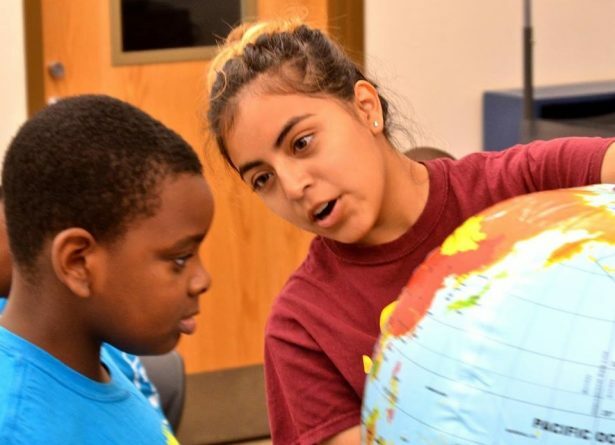 Through Peace Exchange, Chicago youth experience international travel to learn about nonviolent social movements and become mentors for their communities. When one sees Chicago in headlines, violent images — particularly those involving African American and Latino youth — often come to mind. The city’s segregated neighborhoods, like Austin, Englewood, North Lawndale, Garfield Park and Little Village, are predominantly black and brown communities that have a reputation as tough and violent. The common narrative of these neighborhoods is that they are where the lives of poor people of color are lost to the streets, jails or gun violence. A small program called Peace Exchange is using the teachings of nonviolence to help change the narrative of these communities by working with youth leaders who are interested in peaceful change. Founded in 2013 by youth leaders, the program’s vision was to bring youth out of their neighborhoods to experience transformational international travel to learn about nonviolent social movements abroad. 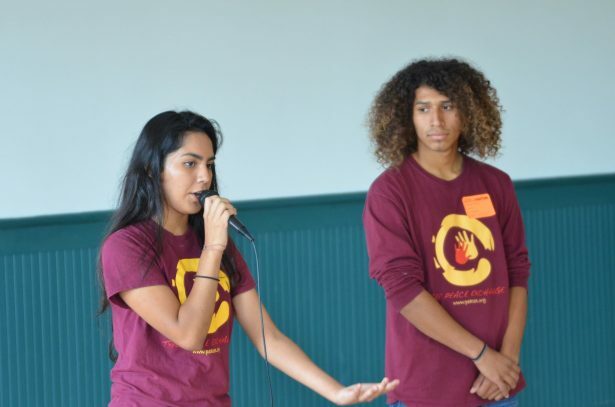 Peace Exchange works primarily with young African American and Latino youth from the west and south sides of Chicago who are exposed to high levels of injustice, from closed schools to police brutality to gun violence. These young people come from some of Chicago’s toughest neighborhoods and know first-hand the effects of inner city violence. The program has developed a model for training and supporting young Chicagoans to become role models and mentors for their own communities. Each year, Peace Exchange works with partner sponsor organizations to support a cohort of six youth from ages 17-22 that it calls Peace Builders. Once the youth are nominated and selected, they go through an intensive 12–month, three-phase program. In the first phase, Peace Builders undertake 80 hours of training from experts and professionals working to address violence in various forms. Training providers include institutions like the Illinois Holocaust Museum and Education Center and the Anti-Defamation League. The trainings are on a variety of topics, from domestic violence and genocide to conflict resolution and peace circles. All training are anchored in nonviolence, mindfulness and compassion to better equip the Peace Builders in bringing their leadership back into their own communities. During the second phase, the Peace Builders travel for 2-3 weeks to an international destination to learn about nonviolent social movements and youth strategies for social change. Past groups have traveled to Myanmar, Thailand, Nicaragua, South Africa and, most recently, India. In each country, partnerships are developed with local organizations, which are youth-led or work with young people. The class of 2013-14 traveled to Thailand and Myanmar, where they spent days at Thai Plum Village, a meditation community founded by Thich Nhat Hanh. Peace Builders learned the art of living in mindfulness and practiced strategies to help improve interpersonal relationships. In Myanmar, they learned from local youth leaders from the Karen State and their struggle for autonomy and survival, as well as their cultural and spiritual ways of staying resilient and peaceful in the face of war and violence. In 2015, the Peace Builders traveled to Nicaragua to learn from the young people at Los Quinchos, a center for street youth who have survived poverty and violence. And the class of 2016 traveled to South Africa, where they learned from the youth of Imagine Scholars about how to create empathy and prevent abuse. Peace Builders visited Soweto and met with local activists who worked to end apartheid. They also went to Nelson Mandela’s home and learned about how young people and students had led a nonviolent movement that helped bring about the changes there. For the third phase, Peace Builders are challenged to come back to Chicago and share what they have learned about nonviolent social change from their training and experiences abroad with young people in their neighborhoods. In the past five years, they have reached over 6,000 youth and allies in their schools and communities. Peace Builders use the power of their personal stories — melded with the lessons they learned from their travels about peacemaking processes and nonviolence — to spread their message to younger youth in their communities. Their films and stories are also shared with audiences at the annual Peace on Earth Film Festival. In addition to the three-phase program, Peace Exchange provides a four session modular program to partner schools called Speaking Peace that offers a deeper dive into nonviolence. The Peace Exchange does this thanks to the help of the Communities in Schools of Chicago, a partner organization that makes referrals from local public and private schools. Speaking Peace is driven by requests from elementary schools that seek peace education. The program teaches tolerance, responsible decision-making and nonviolence through discussions, storytelling, role-playing, games and documentary films. Each of the four sessions, which are taught by Peace Builder alumni, touches on a number of social and emotional learning skills with an emphasis on fostering self-awareness, developing empathy, nurturing positive relationships and acting responsibly. 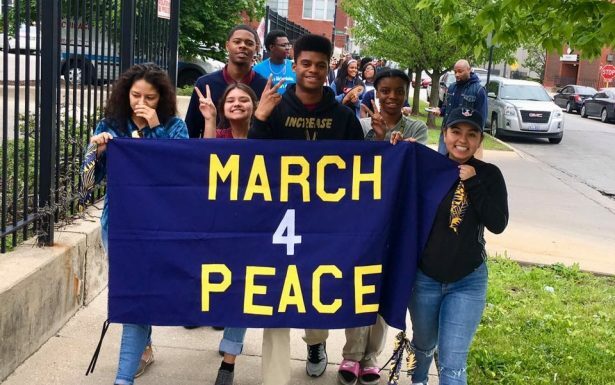 Peace Exchange’s goal is that 3,000 students in the Chicago area, primarily in the fourth through eighth grades at schools, will take part in Speaking Peace each school year. Those who have studied and participated in nonviolent social movements know two key lessons: Peacemakers are not born, they are made; and before any social change can occur, individuals must first change. It is on these premises that Peace Exchange exists. Alumni have been transformed by their experiences in the program. Take Anthony Green, a Peace Builder from the North Lawndale community, who works part time at a local chain store. North Lawndale has an unemployment rate almost triple the average in Chicago. At age 22, he is the oldest brother to 12 siblings and has had violence personally affect him. He was nominated by UCAN, a sponsor organization in Chicago that works with high risk youth. Stefany Rendon, a 20-year-old from Cicero, was another participant in the program. She was nominated by her sponsor organization, the Josephinum Academy of the Sacred Heart High School. She remembers growing up and becoming immune to violence. When she was a child, gunshots went through her living room windows and over her head. In 2015 she traveled to Nicaragua and now leads with a message of peace wherever she goes. Peace Exchange believes in the power of youth and of nonviolence. The root causes of youth violence are many. If violence is to be stopped, allies and mentors must ask themselves some tough questions: How am I creating opportunities for poor young people of color impacted by violence? How am I encouraging their interest in peacemaking? How am I supporting youth voices for change in this society and around the world? With nonviolence, one must recognize that the ultimate resource is within oneself and others. Every young person has unlimited potential and all they need is to be provided with meaningful opportunities for positive change to occur. In doing this work, it has become clear that young people are hungry for this kind of peace knowledge and skills. The key to changing society is changing oneself, and Peace Exchange is helping to make that happen, one young person at a time. Henry Cervantes is program manager for the Peace Exchange. Cervantes is a volunteer trainer of nonviolence at Cook County Jail in Chicago. He serves as a facilitator for the James Lawson Institute and is on the board of directors of The Crossroads Fund. Henry is an amazing young man, wise and fearless and dedicated to bringing nonviolence to some of the roughest neighborhoods in the US. Keep giving us his stories and analysis. An interesting concept. To what extent are the outcomes measurable? How do such diverse experiences compare in terms of their final impact? Are the methods of some non-American cultures easier to apply than others? Email me at hcervantes@hfm.org. I’m more than willing to discuss or collective impact and measurable outcomes with you. Our intense training, transformational travel and community outreach have left a profound impact on our Peace Builders as well as on the communities they serve. Email me and let’s continue this discussion. Done Henry. Looking forward to hearing from you.